I just want to send a note of thanks. When we got the dress.....it fit beautifully! Thanks so much for the fast delivery and the prompt service. I will definitely refer you to others and will be coming back here for future purchases. Thanks so much! Thank u! the dress came the same i contacted u it was just what i wanted and i will be continueing to buy from u. this was the most pleasant buying i have ever did online befor and again thank u ! Ordering from a website for the first time can be a very uncomfortable thing - - but I was so happy to see what great quality your clothes are, and at such great prices! The sizes were a true fit! I want to say THANK YOU for everything. Your dresses are absolutely GORGEOUS!!! This is my third order with you and each time I have been COMPLETELY satisfied. THANKS FOR EVERYTHING!!! I received my dress yesterday!! I immediately tried it on and it fit perfect! Thank You for proving me the story of getting a beautiful dress online without the horror stories! 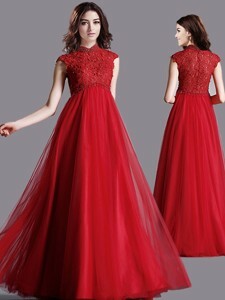 Hello, I just wanted to let you know how much my daughter and I loved the gown we purchased from you. It's simple, but very elegant. Again, thank you so much. We will tell everyone we know where to get the best deal. We were all so very pleased with your company. Everything came as you said it would and fit perfectly. I would give an exceptional high rating for your company and an endorsement that we were pleased with your selections of dresses and your recommendations on time lines. Shop Dresses ABC for your best Mother of the Bride dress or gowns for the Mother of the Bride or Groom. These Mother of the Bride dresses or mother of the Groom Dresses are elegant and sophisticated. Our collection includes short Mother of the Bride dresses that are chic and classy and Mother of the Bride dresses that are long and luxurious. We have a selection of the latest colors and styles to complement the wedding theme. Whether you are shopping for a plus size mother of the bride dresses, plus size mother of the groom dresses,long formal dress for Mother of the Bride or an elegant short dress, look no further for the perfect formal dress for the Mother of the Bride or Groom.